Beacon Press: Is God A White Racist? Published originally as part of C. Eric Lincoln’s series on the black religious experience, Is God a White Racist? is a landmark critique of the black church’s treatment of evil and the nature of suffering. 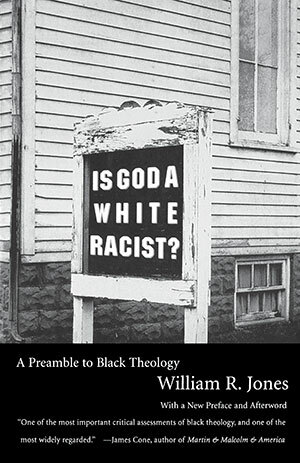 In this powerful examination of the early liberation methodology of James Cone, J. Deotis Roberts, and Joseph Washington, among others, Jones questions whether their foundation for black Christian theism the belief in an omnibenevolent God who has dominion over human history can provide an adequate theological foundation to effectively dismantle the economic, social, and political framework of oppression. Seeing divine benevolence as part of oppression’s mechanism of disguise, Jones argues that black liberation theologians must adopt a new theism that is informed by humanism and its principle of the functional ultimacy of woman, where human choice and action determine whether our condition is slavery or freedom.